Someone once remarked to Sir Edmund Hillary that he had so many heroic achievements yet remained essentially a modest Kiwi. He replied: "Well I have a great deal to be modest about." The same could be said of Sir Jon Trimmer's career, with his wife, Lady Jacqui, at his side for decades, as they climbed a mountain of challenges, avoiding many crevasses along the way, to put the art of ballet in their country ahead of their own international career opportunities. Jonty's accounts of some of the low ebbs over the years are testament to the commitment he, Jacqui and a legion more dancers have made, and for which they deserve our thanks and respect. Hillary again: "I am a lucky man. I have had a dream and it has come true, and that is not a thing that happens often to man." Raise your glass to the Trimmers. 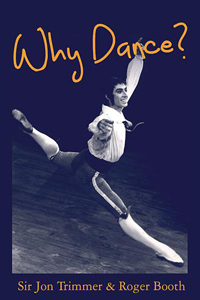 We are talking about a phenomenon of ballet not only in New Zealand but world-wide. Sir Jon is the longest-serving surviving professional performer in world ballet. At age 79, he is still performing with wit and focus, yet is equally attentive to the career needs of the younger dancers he has been a role model to for decades. Stepping along nearly a decade behind him would be the leading dancers of the Royal Danish Ballet, who usually retire at 40, may elect to stay on as character dancers or teachers, but who absolutely must retire at 70. (Biggest difference there is the life pension and accommodation provided by the State as the dancers retire. Trimmer deserves no less here). I’d have thought Why not dance? a better title when you read about the generations of Jonty's extraordinary family who sang, played music, danced, dressed up, told stories and performed. Coral, his sister, a celebrated musician on harmonica, and nephew Matthew Marshall a leading guitarist, are only two from many. Wit, ingenuity and a quintessential modesty seem to be in the family genes, along with a dogged determination that never, ever, gives up. Why give up? Jon acknowledges the two giants of ballet who inspired and guided his early career. After learning from his sister Pamela Lowe (who remains a presence in the book despite her untimely death), he was singled out by Poul Gnatt, the Danish dancer who founded our national ballet company in 1953. Gnatt, aged only 30 when he did that, would have been 95 this year. He might still be watching over the fortunes of ballet in New Zealand, so anyone involved today should think before they move. The other colossal talent in New Zealand ballet, and Jon's beloved mentor and friend, is Russell Kerr, about to be honoured at Auckland’s Tempo Dance Festival in October. The country's most prolific choreographer, at age 89, still as clear-headed and ever-focused on the defining and central importance of dancers in a company; not the directors, managers, administrators, funders, governors, politicians etc. etc. who build their careers around the dancers, though you could sometimes be forgiven for thinking it was the other way around. The end chapter is a tribute and assessment of Jon by Russell. The most poignant paragraph in the entire book is the account of how Russell would tell Jon to take his lunch and sit in the park to watch people walking by, study their gait, their deportment, their timing, their expressions, to catch their character, their mood, so as to bring representation of characters to life on stage. That's a gem within the appreciation of ballet that most people think of as a highly stylized and esoteric art. The account of the two years the Trimmers spent at Royal Danish Ballet includes names of Denmark's truly great dance practitioners and it is a pity not to have these fleshed out within a context of Danish ballet history, since there would be real international interest in reading more of the interactions with, for example, Harald Lander, Flemming Flindt, Erik Bruhn, Vera Volkova, Hans Brenaa, Sorella Englund, Eva Evdokimova. Given the Danish and Bournonville heritage that has distinguished New Zealand Ballet from the start, Poul Gnatt, his sister Kirsten Ralov (associate artistic director of RDB), through New Zealanders Martin James, Andrew Bowman, Chris Rickert, Amy Beale who have since danced with the Company, this does seem a missed opportunity. There are however many anecdotes about New Zealanders that bring a highly entertaining quality to the book. Read it all but savour especially the stories of Kerry-Anne Gilberd, Pamela Meakins, Kevin Baddiley, David Galbraith, Nan Arrow and Tomas Augustus. Hugo Manson conducted a major oral history with Jon and Jacqui but curiously this is not referenced as an editorial resource for this book. It was further surprise to me that Cathy Downes' poignant production, Your Half-hour Call, Mr.Trimmer from 1998, is not referenced either, a pity since it contained invaluable documentation of Jon's career (and could well be updated for a return season, as also could Helen Moulder's theatrepiece, Meeting Karpovsky, in which Jon also acted). There's a section on tips for young dancers which, while helpful, does sit a bit self- consciously on the page. The correct spelling of some names (Eric Languet, Ken Sudell, Sara Neil, Karl Welander, Garth Welch) should be also be noted. Jon and his brother spent a month on an ashram in India. The account of that experience is a salutary and honest one, and reveals the self-awareness and contemplation that Jon has nurtured in himself as both person and artist. I recommend a visit to Ngā Taonga Film Archive to watch The Servant of Two Masters, Gray Veredon's choreography, Kristian Fredrikson's design, with Jon Trimmer and Harry Haythorne sparring in the lead roles. Your ribs will ache from laughter. Then watch Jon dancing Les Sylphides from maybe 55 years ago. You'll be reduced to tears of wonder at Jon dancing in his classical heyday. Here's hoping RNZ will commission a reading by Jon of these memoirs for broadcast. The nation would listen spellbound to the extraordinary accomplishments, talents and dedication of their favourite dancer. Roger Booth staged a spirited book launch at Te Whaea, fronted by Turid Revfeim, to which he generously brought Coral Trimmer from Melbourne and Kevin Baddiley from Auckand to take part in a memorable tribute to their beloved brother and friend. Read the book and raise your glass. Original generation time 1.4119 seconds. Cache Loaded in: 0.0673 seconds.